*Note: You will need Acrobat Reader to view this file. You are looking at an absolute gem of a tool for improving interactions with your family, friends, and career associates. 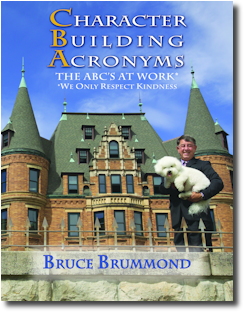 Bruce has constructed lessons in Character Building Acronyms that reflect and expand upon the essence of the messages that are so masterfully introduced in his book Acronyms Building Character. These exercises will allow you to internalize the concepts which will help transform the dynamics of your relationships to make living and loving more fulfilling than ever imagined. Incorporating portions of this material in meetings can certainly enhance the regular agenda. You might also consider using the acronyms, concepts, or complete chapters for personal exercises, small group sessions, family activities, or for organizational training sessions. Success is much more than a place - it is a journey.